June 30 passes off with some celebrations in tiny Mizoram as the day of peace or Remna Ni but the rest of India takes no notice. That is the day in 1986 that the memorandum of settlement between the Indian government and the separatist Mizo National Front or MNF was signed. The accord brought back peace and tranquility to troubled Mizoram scorched by two decades of bloody insurgency. The 1986 Mizo accord worked as no other settlement between the federal government and a rebel group has in post -independence India. It is seen as a model of peace making and conflict resolution. This is specially significant because it stands out in stark contrast to the failure to work out a settlement to end the Naga imbroglio that has lasted for six decades. 1975 Shillong Accord did not work but 1986 Mizo accord did. Apart from the lessons to be learnt about why the Mizo accord worked and peace has held in the tiny state and why similar efforts has not worked on the Naga issue, the day needs to be celebrated as a Reconciliation Day across India to highlight the essential spirit of accommodation that has characterised the post colonial Indian state . Two years ago in 2016, Remna Ni was celebrated with great fanfare in Mizoram because it was the 30th anniversary. It is interesting that at the main celebrations in the Assam Rifles Lanmual (parade grounds) in Aizawl, then Governor Nirbhay Sharma hoisted a black and white flag modified from the Mizo ngotekherh (as like the traditional puan or shawl) which bears the map of Mizoram and a sketch of two hands clasped in a handshake while the peace symbol dove hovered above the flag. 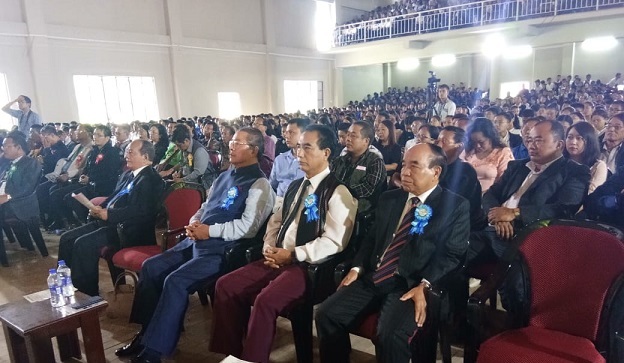 It was a poignant way to mark the spirit of peace and reconciliation, of which Mizoram has become a symbol and a substance of. A country bedeviled by so much violent separatism in Kashmir and northeast should seek to celebrate its success at peace making, not just to underscore the need for reconciliation as national goal and policy but also to look at successful models and best practices in conflict resolution. Narrow partisan considerations should not stand in the way. In fact India as a country should also celebrate 16 December as Victory Day in much the same way Bangladesh celebrates it to mark the surrender of Pakistan armed forces in what was then East Pakistan. This was easily India’s successful diplomatic and political success after independence and led to the break-up of Pakistan. Why should the Dec 16 celebrations be just restricted to the army’s Eastern Command? That Dec 16 1971 was achieved by Indira Gandhi government and 30 June 1986 Mizo accord was achieved by her son Rajiv’s government should not prevent India as a country from celebrating them as Vijay divas and Shanti divas much as the landing of the Mangalayan on Mars be celebrated as Vigyan Divas to spread the spirit of science and mark India’s success in it.